The Universal Security Instruments MDS300B Smoke and Fire Alarm responds quickly to both fast-flaming and slow-smoldering fires to protect your family against deadly threats in the home. Perfect for new or replacement installations, the MDS300B is suitable for houses, apartments and mobile homes. Universal Smoke Sensing Technology responds 87-percent faster to slow smoldering fires and responds quickest to fast-flaming fires. Auto sensitivity calibration provides superior nuisance alarm protection and creates consistency in alarm sensitivity. 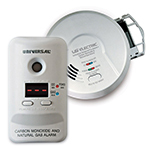 This smoke and fire alarm has additional automatic features including a self-diagnostics check to ensure proper operation, a sensitivity adjustment for changes in temperature or humidity and an end-of-service life warning that sounds when it's time to replace the battery. A Duracell battery (included) operates the alarm and continues protection in the event of a power outage. 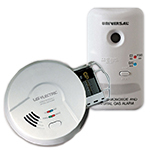 This 2-in-1 alarm features a front-loading battery drawer for replacing the battery without removing the detector from the bracket. Mount the bracket to any standard wiring junction box and use the large mounting base to cover imperfections in drywall. For maximum protection, install a smoke alarm inside every bedroom, outside every sleeping area and on all levels of the dwelling. 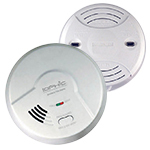 The Universal Security Instruments MDS300B Battery-Operated Universal Smoke Sensing Smoke and Fire Alarm comes with a 10 year limited warranty. Very good smoke and fire alarm.